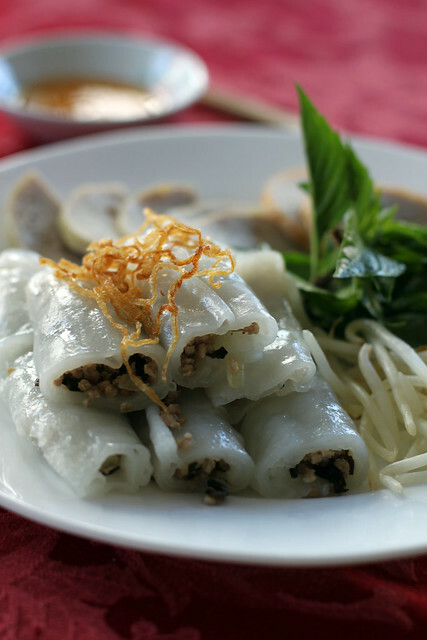 Bánh Cuốn, Vietnamese Steamed Rice Rolls, is one of Jane’s favorite food to eat . Her typical and predictable requests for Sunday breakfast is usually Bánh Cuốn with Chả Lụa. Normally, I buy a couple of pounds of Steamed Rice Rolls from Thanh Tri on Senter Road and all the accompaniments at the closest local Asian grocery store to assemble the delicious breakfast. However, I’ve been curious about how rice rolls are made and decided to learn how to make it… at home! 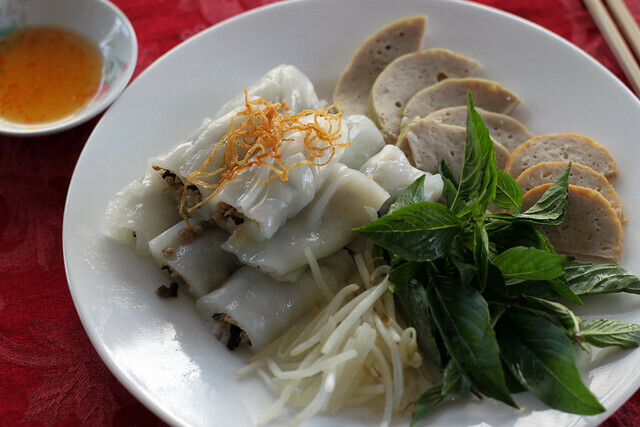 Bánh Cuốn are thin, translucent, and delicate sheets of cooked batter (mixed with tapioca flour and rice flour) filled with meat (usually combination of ground pork, onions, and wood ear mushrooms) and rolled. 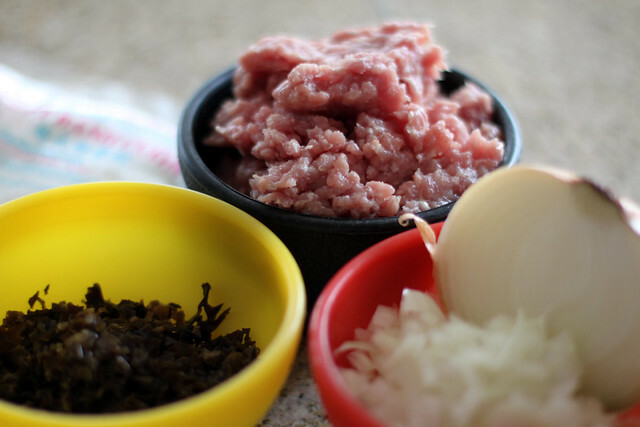 If you don’t like the meat filling, you can enjoy the plain rice sheets with slices of steamed pork. Traditionally, the rice sheets are steamed over a cloth covered steamer, but since I didn’t have access to the traditional tools, my 12-inch non-stick skillet with the lid worked just fine. To make the rice sheets, I added the batter to the center of the skillet, swirled the skillet until the batter is evenly distributed, covered the skillet with a lid for about a minute, and transferred the rice sheet on a plate before assembling the rice rolls. It took me several attempts to get the rice sheet to the consistency and shape I wanted, but after I got the technique down, it was pretty easy and fun. 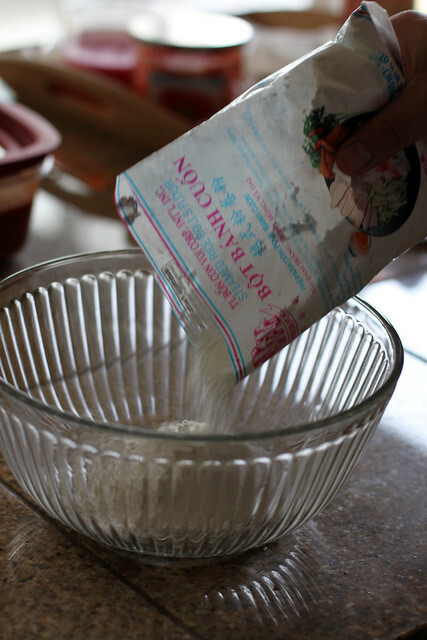 To make the batter, follow instructions on the back of the Steamed Rice Roll Flour package. For this package, add contents of package to a large bowl, add 4 1/2 cups of cold water, and whisk until the batter is smooth. 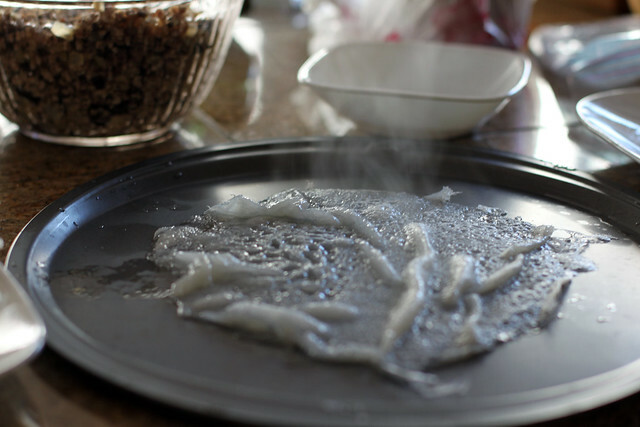 To make rice sheet, heat 12-inch non stick skillet on medium heat and add a little vegetable oil when skillet is hot. Pour about 1/2 cup of batter in the center of the skillet, pick up the skillet by the handle and swirl the skillet until batter evenly coats the skillet. Put lid on the skillet for about a minute to allow the top of the batter to cook thoroughly. Place the top of a large plate over the skillet and invert the skillet to the dish so the rice sheet will lay flat on the plate. 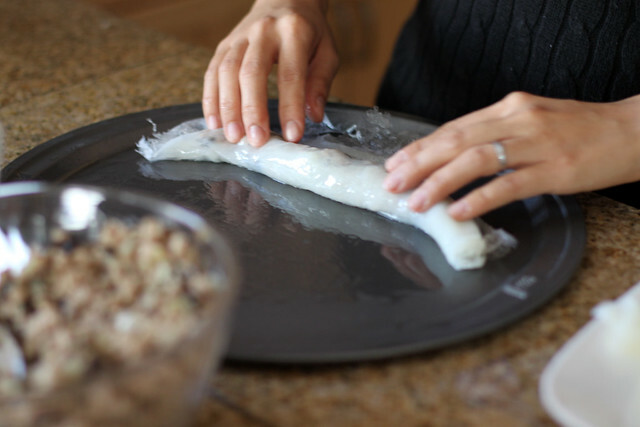 To make rice roll, when rice sheet is slightly cooled, add 1-2 teaspoons of filling to the rice sheet and roll. Repeat step three until there is no more batter or filling. Assemble plate of rice rolls with your favorite accompaniments. thanks! will be making this one for sure!